Your mobile apps must be great at capturing but also great at displaying it. 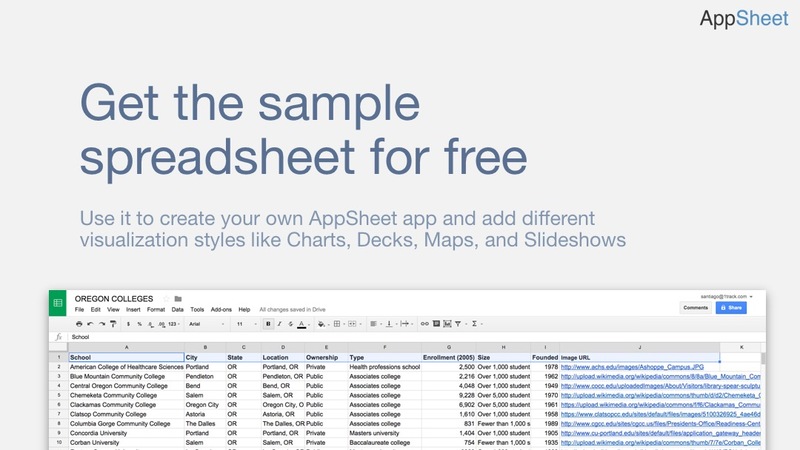 When you have a spreadsheet that you want to take while on the go, AppSheet can help you consume the data in a richer, mobile-friendly way. We built a sample app with a list of colleges in the State of Oregon to showcase the main ways you can display information with AppSheet, they are all available in the UX Menu of the app editor. If you want to use the sample spreadsheet we used for this app, you can find it in a link at the end of this post. Remember to visit our community to share questions and ideas about your app! [UPDATE] Many of our users asked us to provide access to the sample app in addition to the free sample sheet. You can a link to the sample app at the end of the post.